Cleaner Compost: Delivering A Near-Pristine Product! A plastic-removal system works in tandem with a composter’s screen plant to make a near-pristine product. A wheel loader dumps green waste containing pieces of plastic into a grinder’s hopper. A moment later, that plastic is ground into an infinite number of itty-bitty pieces that are dispersed in the processed material. This can be a nightmarish scenario for compost producers facing government regulations limiting how much contamination can be present in a finished product. Just ask Bob Dressel, owner of North Mason Fiber Co. in Belfair, Wash., which produces organic compost, landscaping bark and more from raw products such as land-clearing debris, yard waste and fish waste. For years, Dressel had to live with the contamination and hope his compost was up to spec. Dressel no longer has to worry, though, because of an investment he made in a machine that removes plastic and other lightweight materials from compost. 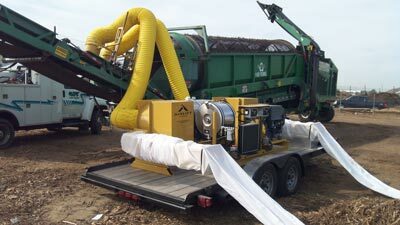 The machine, the Airlift Separator, removes about 95 percent of the plastic from North Mason’s McCloskey 733 trommel screening plant – and it removes between 50 and 80 percent of plastic on the first pass through it, Dressel says. So an achievement of 95 percent removal is that much more remarkable.